Good morning children! Today, we're going to talk about recording the bass drum with 2 mics, with the return of our Men in Black look-alike, Keenan. Why 2 microphones? Because it's useful at the mix sometimes to have 2 sources, 2 different kinds of tones to blend. So, we're going to try 2 microphones, probably different pairs, to see different variations, and then we're gonna blend them. Let's see... Somewhere like this. We liked that sound. That was cool. And then, a 47 FET right outside. what do they sound like together? Tremendous question... Let's find out! Cool! So, that's definitely more raw material to work with on my mix than if I only have one mic. And that's fun! But it creates new problems. There's one source of sound and two points of capture, which means that this source's sound is gonna arrive to the 2 microphones at different times, and that's gonna create phase cancellations, or phase enhancement. So some of the bass is gonna go away, and some of the bass is gonna be enhanced, randomly, depending on where I put the microphones. Even when you know it and you're used to it, it's still annoying and amazing, every time. So for example, if I take this microphone, and I push it back like a pinkie, this is not gonna change the course of modern music, right? I moved it about this much. Let's check this out! So that's the problem! Now, we have a fatter bass, but what of the relationship between this mic and the snare? And these 2 mics and the overheads? And the overheads and the snare? And that's the problem with recording drums, it can turn into a phase insanity, so you have to be very careful about what you're doing, and that's by listening very intently in the Control Room, while you set up your mics. So let's go do that. Let's go to the Control Room to listen to these 2 mics, and their relationship, and what they respectively do, and what they do together. It's always a good idea to record part of the song, the song, not the hardest thing that the drummer can play as fast as he can, the actual song, and then come listen to it in the Control Room with the drummer. Now, you have your point view, and then you have the drummer's point of view, he's been listening to those drums for a while. His view is a little skewed, because he listens to them with his ears and his body. You only listen to it with your ears. But it's nice to have feedback from the actual player and you can choose to ignore it, I do very often! Then, you listen to it, and you make your judgment calls. Let's do some listening! The first thing I'd like to do is to get a real feel for the phase relationship. So if I solo the outside drum, and listen to the first placement, it sounds like this. Very, very, very close! They sound basically the same. He played a little different, but that's basically the same sound. So then, let's not forget that it does this when you listen to both at the same time. So this is now the first take with the 2 microphones. And the second take with both microphones. If you're having a hard time hearing it, that's cool, let me show you a way to focus on the difference. Listen to the first take again, I'll play it again, and try and visualize just how tall the bass drum is. It's always good to add visuals to sound. maybe this happens a little bit. I'll play it again, and see if that helps. Obviously, this is more subtle than your regular A/B comparison, but I think it's crucial. If you're listening on your laptop's speakers, or iPod headphones, or if your sub is on stun, or if you're listening from the other side of the room while doing email on a different computer, I can't help you! That said, I like the second take, so I'm gonna stick to that. And now, I'm gonna listen to the inside mic and outside mic separately, and then blend them. So the inside mic sounds like this. lots of mechanical noise, really. Very drummer-oriented, right? And then here's the outside one. Together! They complement each other very well. And the beauty, now that we have 2 mics, is that we can play with the blend. I kind of like that! Because that's fat. Of course, this is all pretty much irrelevant without context, because we have overheads, and snare, and we have bleed of everything into everything, so let's play the whole drum set, all the microphones, all 5 of them, and then I'll play with the 2 bass drum microphones, and try and look into some interesting sounds by changing the blend. So first, let's select it. Then I'll start with where I stopped: more outside kick, less inside kick. I'll play it once, then I'll change it, maybe a couple of times, so we can have flavors. Here we go! So the one with more outside microphone has more boom, and the one with more inside microphone has more punch, which is what we expected. Now it's all a question of taste, and where you wanna put it. I think it's a nice combination of boom and punch. But... maybe not necessarily the sound I want for this song, so maybe we should go back to the studio and switch microphones, and see what we get with a different set! Let's try something different. Which at the time I thought: hey, that's a tom microphone! And then, he put an 87, and I was like: What? He has an 87, and he puts it on a bass drum? Woooh!!! I'd use it on vocals! If I had one... So let's listen to this. Cool! That sounds great. It's so different, right? But... I feel that if we move this a little bit, maybe we'll be able to use the phase relationship between the 2 mics to gain a little more bottom out of this. I like the percussion of it, but I'd like it to have a little more... fat. So I move it just a tiny bit. Like this. Something like that. Let's see what that does. Here we go. Cool! That's pretty much what I wanted. It's really nice, and the phase relationship now is really good, and it gives me that punch, but still some bottom. There is no particular combination that you're supposed to use, you can use just about anything. This one happens to have the particularity that it really sounds natural, and completely unprocessed. And then, one other ribbon. with DAW recording, because they're so gentle. This is a Royer R-122, and this is a Beyer M88. These are two microphones that are maybe more transparent, and less rock'n'roll sounding if you will. I think this is really cool, I really like it. It's fat, it's punchy, it doesn't have any phase issues. I think the 2 microphones really complement each other and make a whole that is bigger than the sum of the parts. To me, it sounds really "mixed", almost. I would have to work very little on this to make it sound the way I want in my record. Just so you know, everything today is been done just with the mic, the cable and the preamp, no EQ, no compressor. For the bass drum, the preamp is a stereo 2108 by Universal Audio. As a reference, the overheads are a pair of 451s, AKGs, through an SSL stereo preamp. 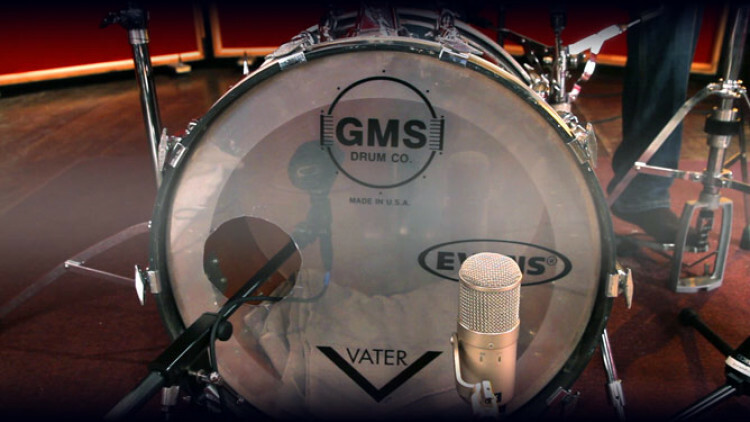 The snare drum is a 57 through a Neve preamp. So why don't we go back to the Control Room, and A/B all the sets, and weigh the pros and cons of every set. Thank you Keenan! Let's listen to all three in a row. First, the D112 and the 47 FET for a more traditional sound. Then the 421 and the U-87. And then the M88 and the R-122. In a row, without talking, it's even more striking. Check it out. Same order, all three in a row. and the one in the middle is, well... in the middle. As a summary, if you're looking for a method to get to a better bass drum sound, maybe you should think of doing it this way. First, pick your microphones based on what's available to you, or not available to you, and also based on your experience, maybe a little bit on this video, until you get your own experience. I can vouch for it, it works pretty well. Once you have a tone you like there, take your second microphone, and put it on the outside, and then raise the level of the second microphone. The point here is to make sure that the second microphone enhances what the first microphone is doing, and doesn't take anything away. So one of the crucial points when you add that second microphone and you raise that fader, is to make sure that it's complementary, that it enhances what the first one is doing, and doesn't take anything away. For example, if you push that fader and you can hear the bass that you heard from the first mic go away, that means you're out of phase. You have to move that second mic until that doesn't happen. Once you've done those two things, you have enough raw material to be able to do pretty much whatever you want at the mix by either blending, picking one or the other, compressing, EQ'ing, but at least you know that you have two great sounding microphones that are complementary, in phase, and that are a great basis for your whole drum sound. nice vid, i like the second set up the best. Real punchy and knocking! Hey Fab, How is moving the mic compared to using phase invert on the preamp? Thanks! nice! The ribbon sounds sooooooo fat man.